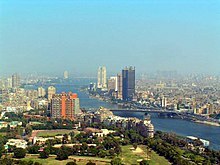 Cairo (Arabic: القاهرة‎, usually transliterated as Al-Qāhirah) is a city in Egypt. The city name can be translated as the one who won. Cairo is sometimes called "Mother of the World" (Um al Dunya). The city is the capital and largest city in Egypt. The city is on the Nile River. The city of Cairo has a hot desert climate (BWh), meaning it has a hot, sunny and dry climate a year long. The city, however, has more humidity than other cities with the hot desert climate (BWh). The area around the city was an important focal point of Ancient Egypt. In 968, the Fatimids entered Egypt and they made Cairo the capital of their caliphate. The Al Azhar mosque and university was made in 972. This became the world's oldest university. It is the most widely known seminary in the Islamic world. In 1992, Cairo was devastated by a 5.8 magnitude earthquake that caused 545 deaths, injuring 6,512, and made 50,000 people homeless, the most destructive since 1847. The great pyramids of Giza and the step pyramid of Sakkara are just outside of the city. The Egyptian Museum holds the world’s largest collection of antiquities from the time of the ancient Pharaohs. Many treasures from the tomb of King Tutankhamun are in this museum. 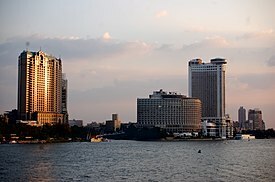 People from Cairo are called 'Cairenes'. Naguib Mahfouz, novelist, Nobel Prize in Literature in 1988. ↑ 3.0 3.1 3.2 3.3 Hedges, Chris. "What's Doing in Cairo," New York Times. January 8, 1995. ↑ "Cairo (A) Climate Normals 1961–1990". National Oceanic and Atmospheric Administration. Retrieved April 14, 2014. Hedges, Chris. "What's Doing in Cairo," New York Times. January 8, 1995. The Simple English Wiktionary has a definition for: Cairo.